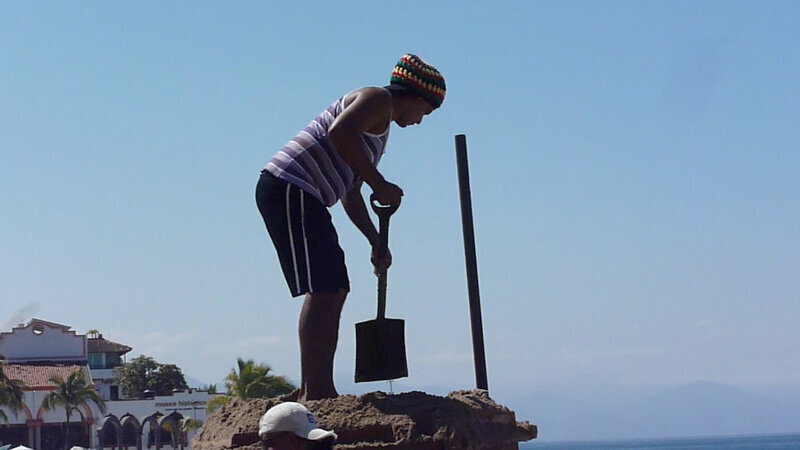 A man bends with a beautiful hip hinge in Puerta Vallarta, Mexico. To see if you’re bending correctly, try a simple experiment. “Stand up and put your hands on your waist,” says Jean Couch, who has been helping people get out of back pain for 25 years at her studio in Palo Alto, Calif. In other words, when we bend over in the U.S., most of us look like nuts! But in many parts of the world, people don’t look like cashews when they bend over. Instead, you see something very different. I first noticed this mysterious bending style in 2014 while covering the Ebola outbreak. We were driving on a back road in the rain forest of Liberia and every now and then, we would pass women working in their gardens. The women had striking silhouettes: They were bent over with their backs nearly straight. But they weren’t squatting with a vertical back. Instead, their backs were parallel to the ground. They looked like tables. After returning home, I started seeing this “table” bending in photos all around the world — an older woman planting rice in Madagascar, a Mayan woman bending over at a market in Guatemala and women farming grass in northern India. This bending seemed to be common in many places, except in Western societies. “The anthropologists have noted exactly what you’re saying for years,” says Stuart McGill, at the University of Waterloo in Ontario, Canada, who has been studying the biomechanics of the spine for more than three decades. When you hip hinge (left), your spine can stay in a neutral position, while the hips and upper legs support your body weight. When you bend at the waist, the back curves, putting stress on the spine. 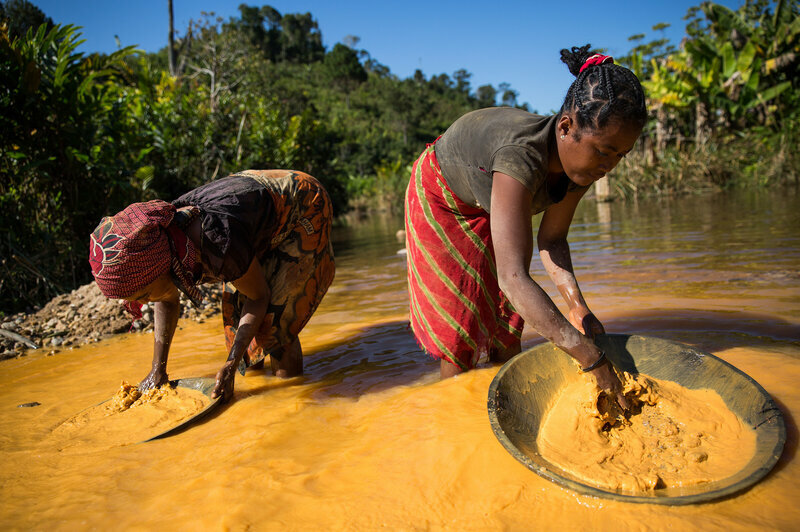 Rice farmers in Madagascar pan for gold to supplement their income. When people bend with the cashew shape in their back — like we often do — they’re bending their spine. “That puts more stress on the spinal disks,” McGill says. Disks are little rings of collagen found between each vertebra, which form a joint. But they aren’t made for tons of motion. “They have the mechanical characteristics of more like a fabric,” McGill says. “If you took a cloth, and you kept bending and stressing it, over and over again, the fibers of the weave of the cloth start to loosen up and delaminate,” he says. 1. Place your feet about 12 inches apart. 2. Keep your back straight. 3. As you bend your knees, allow your pubic bone to move backward. 4. Fold over by allowing your pubic bone to slide through your legs, down and back. Eventually, over time, this fabric can fray, which puts you at risk of slipping a disk or having back pain. On the other hand, when you hip hinge, your spine stays in a neutral position. The bending occurs at the hip joint — which is the king of motion. In other words, your boots may be made for walking, but your hips are made for bending. And by “engage the hamstrings,” she also means stretching them. Tight hamstrings are extremely common in the U.S., Kennedy says. They may be one reason why hip hinging has faded from our culture: Stiff hamstrings are literally hamstringing our ability to bend properly. And the hip hinging is sprinkled throughout sports. Weightlifters use it when they do what’s called a deadlift. Baseball players use it when they bat. Tennis star Rafael Nadal does it when he sets up a forehand. And in football, players kneel at the line of scrimmage with beautiful hip hinging. Toddlers younger than 3 years old are great hip hingers. They haven’t learned yet from their parents to bend like a cashew. Whether or not hip hinging will prevent back pain or injuries, doctors don’t know yet, says Dr. D.J. Kennedy, a spine specialist at Stanford University and a former weightlifter. “We don’t have these randomized trials, where we have people lifting things hundreds of times and see how their body responds to hip hinging,” Kennedy says. Still, though, Kennedy says he tries to hip hinge as much as possible. So how in the world do you do this mysterious bending? Back in Palo Alto at Jean Couch’s Balance Center, she tells me the trick: Find your fig leaf. “Uh, on my pubic bone?” I answer shyly. So I try it. I put my hand on my pubic bone as a pretend fig leaf. Then as I bend my knees a bit, I allow my fig leaf to move through my legs. A little crevice forms right at the top of my legs and my back starts to fold over, like a flat table. “Now you’re using the large muscles of your hips, such as the glutes, to support the whole weight of your body, instead of the tiny muscles of your back,” says Jenn Sherer, who co-owns the Balance Center with Couch. And she’s right. My back relaxes, while my hamstrings start to stretch. And boy are they tight! “Wow! My hamstrings are stretching like crazy,” I yell out, while I’m bent over like a table. Liza Shapiro says many yoga websites recommend bending at the hips. A previous version of the Web story mistakenly said waist. Medford Family Chiropractic Center, copyright 2018 .